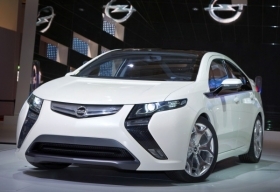 Opel expects "several thousand" Ampera orders a year. RUESSELSHEIM -- Expectations for the Opel Ampera plug-in hybrid car are rising in Germany after a government plan to promote electric transportation has been announced. If demand is sufficient, the Ampera could even be built in a European factory. Production at Magna International Inc. can't be ruled out. "That naturally depends largely on the plans of the future owner," a source at Opel said. At its introduction, the modified sibling of the Chevrolet Volt would be shipped to Europe and sold by Opel under the Ampera name. Opel is figuring on "several thousand" Ampera orders a year. The Volt will be built in a General Motors Co. factory in Detroit. Its battery packs are also expected to be assembled in a Detroit factory starting in November 2010. The expected annual capacity is 70,000 packs. South Korean manufacturer LG Chem is providing the batteries. One battery pack will consist of 220 individual cells and cost about $8,000. "Naturally, the first generation of electric cars will be more expensive than comparable cars with internal combustion engines," said Opel spokesman Andrew Marshall. That's the reason Opel is welcoming the planned incentives for electric transportation. Opel is considering leasing the expensive Ampera batteries, but no decision on that has been made yet. Besides the Volt, GM, still Opel's parent company, is working on a number of other plug-in hybrid cars, based on Volt technology. "The Volt and the Ampera are only the start of the trend," Marshall said. "The technical concept can also be transferred to other models and segments."